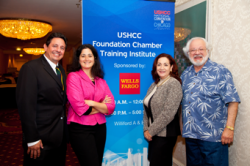 The USHCC Foundation’s Chamber Training Institute provides attendees a two-day learning experience on best practices for social media, membership management and leadership. Since its launch two years ago, there have been 11 trainings, with an additional ten scheduled well into 2015. The Chicago Chamber Training focused on creating an innovative business culture.